My own fashion doppelganger moment was comical. I was living in NY, had just started dancing at a country-western club, and recently learned the two-step. I was in a “cowboy” frame of mind. 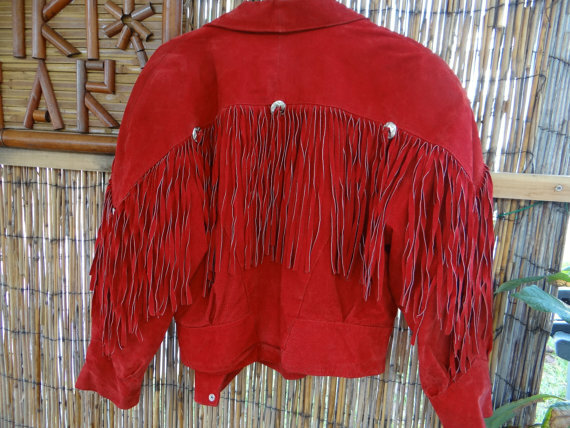 While at a business conference in Nashville TN, I saw this flashy red suede western-style jacket with fringe. Thinking it would be the bomb on the dance floor, I bought it without hesitation. That same night we had a group outing to the Grand Ole Opry and I took the opportunity to break out my new fashion statement. I wore the jacket over my little black dress, preening like a peacock, feeling a bit too proud, and garnering a lot of attention from my team. Halfway through the show, a very small man with a very big cowboy hat and an even bigger guitar came on stage to sing. He was probably close to 80 years old, had a high-pitched twangy voice…and he was wearing the IDENTICAL red suede jacket. My group broke out in gales of laughter. The only thing I could do was laugh with them. It was actually pretty funny. When I got back home, I sadly discovered that the jacket really didn’t work well on the dance floor. It was too hot for dancing and, when I spun, the fringe whipped around hitting me and my partner in the face. The jacket hung in my closet for over 10 years, reminding me of my night of fashion doppelganger hilarity, until I finally gave it to the Salvation Army.